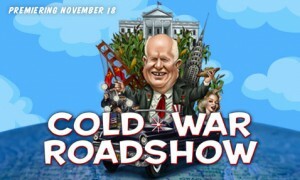 Time magazine profiles Cold War Roadshow, an upcoming documentary about Soviet premier Nikita Khrushchev’s historic visit to the US in 1959, on its website today – including footage of an evasive Marilyn being interviewed by reporters after a luncheon in Khrushchev’s honour at Twentieth Century-Fox. Marilyn’s reluctance to comment may have been as a result of her husband Arthur Miller’s persecution by the rabidly anti-Communist House Un-American Activities Committee. Miller had been acquitted just a year before. In 2010, it was announced that a dramatisation of Khrushchev’s trip would be produced for HBO, but this has yet to materialise. Cold War Roadshow will be broadcast on PBS in the US on November 18: a DVD is also available.